PRO: The Papercut Zine Library is partnering with a bunch of cool orgs, like the Cambridge Science Festival, Sciencepunx, Big Sister Association of Boston, NeuroBoston, and Boston’s Girls Rock Camp to bring a day of skate to girls, women, and all the non-dudes among us. This is an international event and a lot of folks are trying to make sure Boston skaters get to participate. Pretty sick, right? 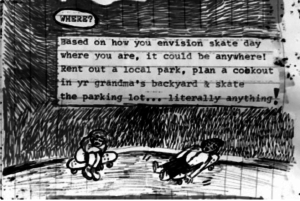 CON: The Lynch Family Skate Park in Cambridge has this pesky insurance deposit clause and right now GSD is looking to raise money to meet it. WHERE YOU COME IN: Your donation will help this magical day of skating and solidarity happen in our lil town. A N D, the fundraiser serves the dual purpose of ensuring that the Papercut Zine Library remains open to the public. Your contribution is literally gonna do like, so much good. Visit PZL’s gofundme to donate! Check out all the info for Girls Skate Day on Facebook! Read about the history of the event and of PZL itself on their website! All donations are appreciated and we surely do hope to see your wonderful faces skating around Cambridge and Boston on Sunday, 4/21.